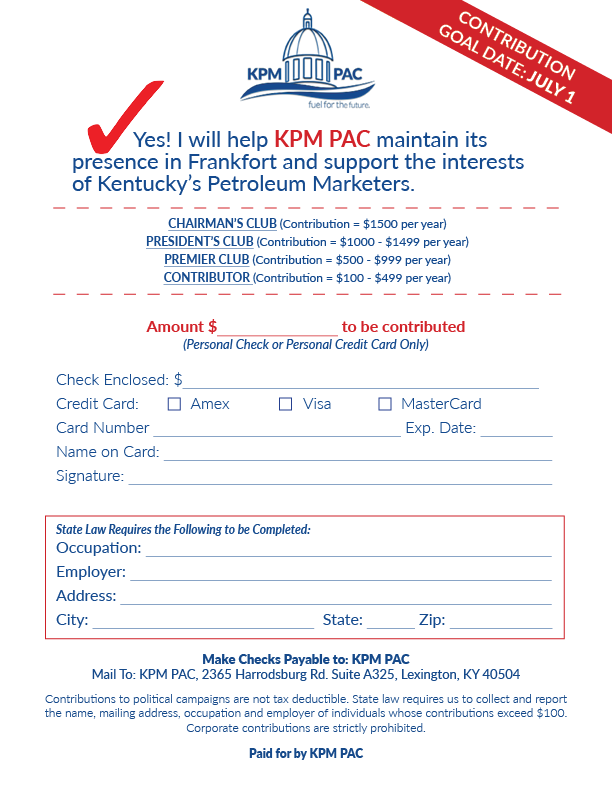 The KPM PAC is a vital tool to work alongside KPMA to promote the interests of petroleum marketers in Kentucky. It is a voluntary, non-profit unincorporated association. Its purpose is to promote good citizenship through the personal and financial participation of its members in the elective process in the Commonwealth of Kentucky. The purpose of KPM PAC is to advocate for the goals and objectives of KPM PAC, and to further the efforts of candidates or office holders who have goals and objectives similar to those of KPM PAC. Contributions are limited to members of the General Assembly, a legislative caucus fund of a political party’s executive committee, statewide constitutional offices, or any other office approved by the KPMA Board from time to time. If you are interested in donating, please print and mail the donor card below. * Contributions to political campaigns are not tax deductible. State law requires us to collect and report the name, mailing address, occupation, and employer of individuals whose contributions exceed $100. * Corporate contributions are strictly prohibited. * Only donations via a personal check or personal credit card accepted. Make checks payable to KPM PAC.